Investigation of child abuse is often hampered by doubts about the reliability of children as only sources of information. Over the last decade, consensus has been reached about children's limitations and competencies. 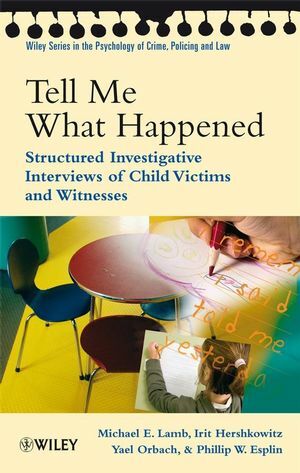 New for the Wiley Series in the Psychology of Crime, Policing and Law, Tell Me What Happened summarizes key research on children's memory, communicative skills and social tendencies, describes how it can be incorporated into a specific structured interview technique and reviews evidence involving more than 40,000 alleged victims. Michael Lamb (Cambridge, UK) is Professor of Psychology in the Social Sciences at the University of Cambridge, UK, and has published widely in this area. Yael Orbach (Bethesda, MD) is a psychologist with the National Institute of Child Health and Human Development. Irit Hershkowitz (Haifa, Israel) is Lecturer in the School of Social Work at the University of Haifa, Israel. Phillip Esplin (Phoenix, AZ) is a psychologist in private practice. Together, they have pioneered research on structured interview protocols. Michael Lamb is the recipient of the 2014 G. Stanley Hall Award for Distinguished Contribution to Developmental Psychology and the 2013 Award for Distinguished Contribution to Psychology and Law. 1 Interviewing Children About Abuse: An Overview and Introduction. 2 Factors Affecting the Capacities and Limitations of Young Witnesses. 3 How do Investigators Typically Interview Alleged Victims? 4 The NICHD Investigative Interview Protocols for Young Victims and Witnesses. 5 Does Use of the Protocol Affect theWay Investigators Interview Alleged Victims and Witnesses? 6 Interviewing Suspected Victims Under Six Years of Age. 7 The Effects of the Protocol on the Broader Investigative Process. 8 Interviewing Reluctant Suspected Victims and Suspects. 9 Interviewing Children with Intellectual and Communicative Difficulties. 10 Promoting and Maintaining Developmentally-Appropriate Interviewing by Training Interviewers. 11 What Has Been Achieved: What Else Needs to Be Done? Appendix 1: Investigative Interview Protocol. Appendix 2: Focused Questions about Tactile Contact [Touching]. Appendix 3: Interview Guide for Youthful Suspects.